It is one of the most particular and unique parks in Europe. The Park of Monsters is a mythologyc and fantasy world in which nature and art create a spooky atmosphere. It is located in Bomarzo, in the province of Viterbo and it was built around 1560 by the architect and antiquarian of the time Pirro Ligorio. 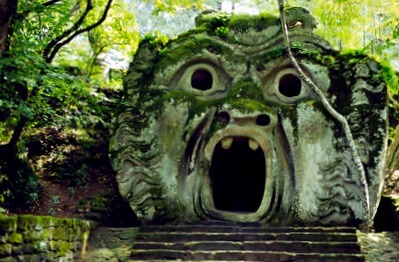 It is called Bosco dei Mostri because of dozens of huge stone sculptures represented grotesque and monstrous characters. Actually, it is a beautiful garden characterized by greenery and odd details.